For many people, a morning cup of coffee is the most important part of starting the day off right. But most coffee makers are made of plastic, which can leech toxic chemicals like BPA into hot liquids. This can be bad news for your health, particularly if you drink a lot of coffee. Why use a coffee maker that could be putting toxins in your coffee? You don’t have to. There are plenty of sharp, stainless steel or glass coffee makers available. Stainless steel coffee makers are one of the hottest kitchen accessories out there. They’re stylish, they’re a great conversation piece, and they make a mean cup of joe. Most importantly, they’re plastic-free, so you won’t have to worry about any toxic chemicals getting into your coffee. We’re going to be looking at the top plastic-free coffee makers on the market right now, from standard drip style machines to traditional percolators to glass and cold brew options. Whether you’re looking for a machine that will make 12 cups on a timer, or a single cup when you need it, there’s a machine here that’s right for you. But how do you decide which one is right when there are so many options? First, let’s take a look at some of the most common questions people have about stainless steel coffee makers. We’ll go over the basics of plastic coffee makers, the types of alternatives available, and wrap up with a review of the top 10 plastic fee coffee makers. Hopefully, this clears up some confusion and helps you make a better decision. Next, it’s time for our reviews. Here, we’ll take an in-depth look at the hottest plastic-free coffee makers money can buy. This is another automatic drip-style coffee maker, so it does have some plastic parts. That said, it’s BPA free, and has fewer plastic parts than the Russell Hobbs machine we reviewed on 2nd place. Specifically, the reservoir is made of glass, which is a huge improvement over a plastic tank. That said, this machine also has a plastic showerhead. This has its upsides and its downsides; we can’t argue with the quality of the coffee, but that’s a lot of plastic exposed to hot water, BPA free or not. 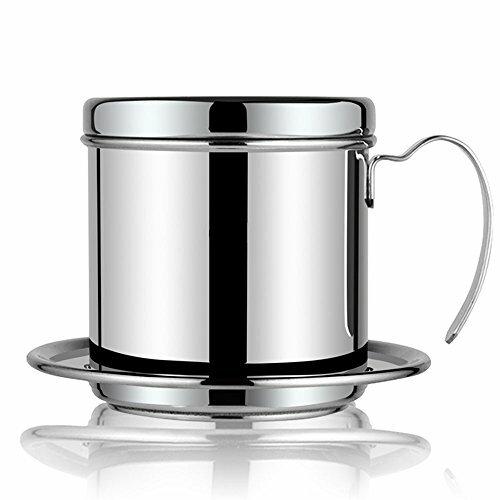 The carafe itself is 100% stainless steel, which is especially nice if you tend to graze on a single pot all day. One nice feature of the OXO On Barista is the ability to set how many cups of coffee you want to make. Let’s say you want to make one cup of coffee before you go to work in the morning. No problem; set the timer for 6 AM and tell it to make one cup. This machine looks really nice on your kitchen counter, particularly the hourglass profile of the carafe and the filter basket. That said, this is a premium coffee maker (#1 drip coffee maker in our category “best coffee maker“), and it comes at a premium price. The 2nd entry on our list is the Russell Hobbs Glass Series 8-Cup Coffee Maker. 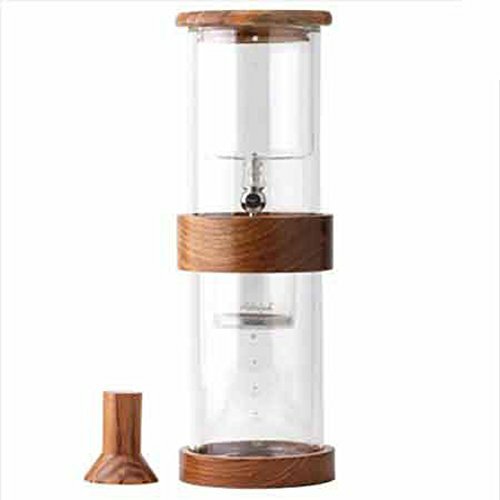 This is an automatic drip-style coffee maker, so it’s not 100% plastic free. That said, it’s one of the best BPA free machines on the market. This is an automatic, fully programmable machine that will fulfill the needs of anyone who needs to get up and go in the morning. Fill the reservoir and put your grounds in the free, gold-tone filter before you go to bed, and the Russell Hobbs Glass Series does the rest. On the downside, it has a plastic showerhead over the basket. This showerhead does a great job of distributing the hot water evenly over the grounds, and we’ll admit it definitely made a delicious pot of coffee. That said, it’s made of plastic, and a showerhead with lots of small streams exposes a lot of surface area to that hot water. The price is on the higher side, but it’s similar to other top of the line coffee makers. It’s relatively compact and has an easy to read LED display. The stainless steel finish is also very easy to clean, which we like. The lone French press amongst our reviews, this coffee maker made our list for one reason: size. There are plenty of one or two cup French presses on the market, but let’s be honest. If you’re going to make one or two cups of coffee, a small drip coffee maker or a pour-over coffee filter is faster and makes a better cup of joe. Nevertheless, this is still a French press, which means it uses a relatively coarse metal screen to filter out the grounds. 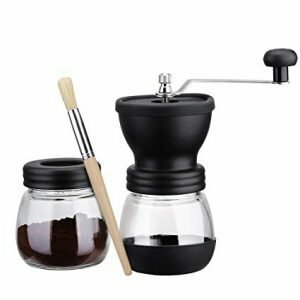 You’ll definitely want a coarser grind to use this coffee maker effectively, which means you’ll need to buy whole beans and grind your own coffee. This coffee maker lets you use pre-boiled water, another advantage of the French press. If you don’t have a stove, you can still make coffee with a microwave or electric kettle using this machine. It’s also smaller than any other coffee maker on our list, and fits easily in any kitchen cabinet. The price for this machine is very reasonable, and it comes in several colors. You can get it in gray, green, orange, pink, or a traditional stainless steel finish. 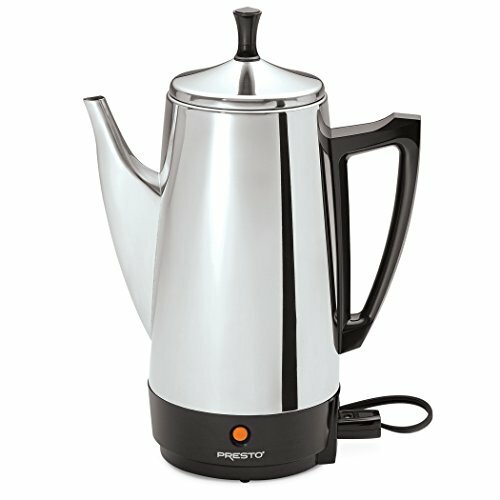 The Presto 02811 12-Cup Stainless Steel Coffee Maker is another electric percolator and another great option for students. It’s made of stainless steel, although the handle and lid handle are made of plastic for a cooler touch. One nice feature about this coffee maker is the indicator light that lets you know when your coffee is ready. This takes a lot of the guessing out of using a percolator, and we found that it has a pretty good sense of how long your coffee needs to boil. High altitude users will want to let the machine run a bit longer, though, since water doesn’t boil as furiously at high altitudes. The Presto 02811 will double as a tea kettle, so you can also use it to make yourself a nice cup of Earl Grey when coffee sounds too strong. It also has a small footprint, which is nice for people in small apartments or dorm rooms. You can make anywhere from 2 to 12 cups of coffee in this machine, so it’s good for serving friends or just grabbing a cup by yourself. It’s also reasonably priced, much lower than many of the competitors. The Eurolux Percolator is a traditional, stovetop percolator that would have been right at home in your grandmother’s kitchen. 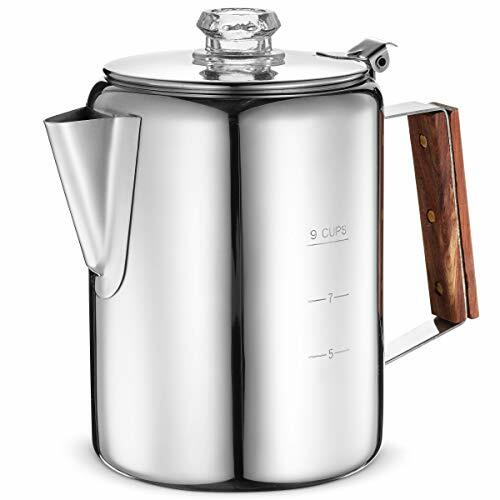 The percolator itself is made out of stainless steel, with a wooden handle and a clear glass handle for the lid. The glass lid handle is just awesome. It’s hollow, so the hot water bubbles up inside it as it’s brewing into coffee, like an old-school version of an LCD display’s progress bar. If you like retro appliances, this is definitely for you. One downside of the Eurolux Percolator is that it needs to be used on a stove. If you’re a student or have a small apartment, this may make it less than ideal for your needs. Other than that, this is a fantastic little kettle that makes up to 9 cups of coffee. The price is extremely reasonable, and the stainless steel basket allows you to use a paper filter or an aftermarket filter. It also comes with a packet of a dozen paper filters, so you don’t need to decide right away. 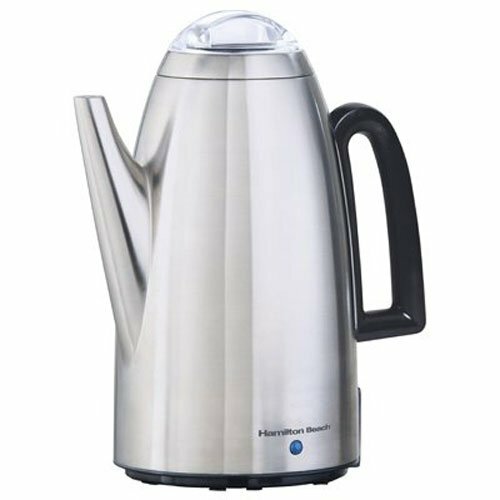 The Hamilton Beach Brands 40614 Coffee Percolator is a sleek, modern electric percolator. This machine isn’t just great for people who want a plastic-free coffee maker. It’s a particularly good option for students, who probably won’t be able to use a stovetop percolator in their dorm. Unlike the previous entries on our list, this coffee maker has no plastic parts, at least none that ever make contact with your food. It’s stainless steel, inside and out, which makes it exceptionally easy to clean. The permanent filter basket is also made of stainless steel and allows you to use either paper filters or an aftermarket gold filter. There’s no timer on this coffee maker, so early morning commuters may want to look at an automatic machine. That said, this percolator is great for people who like to graze on their coffee. It has a warm setting to keep your coffee warm all day. This coffee maker comes at a very reasonable price, less than some percolators with fewer features, and doubles as a tea kettle. It’s designed to make anywhere from 2 to 12 cups of coffee and takes up far less counter space than an automatic drip-style coffee maker. Lindy’s 49W Stainless Steel Drip Coffee Maker has a hybrid design that combines the approaches of a percolator with a drip style coffee maker. It lets you make coffee on your stovetop, but also fully submerges the grounds in water. This makes it faster than a percolator in terms of brewing time. It’s 100% plastic free, and very easy to clean. The handle and lid handle are made of plastic, but they don’t make any contact with your coffee. It also makes 10 cups of coffee, which gives it an advantage over most French presses and manual drip style coffee makers. The design itself is rather unique. The basket sits down in the pot, and you pour water in through the top. Once it’s boiling, you let it sit for a minute, then lift the basket out. This also makes it similar to a French press, so you’ll want to use coarser grounds to avoid getting grounds in your coffee. Because Lindy’s coffee maker requires a stove, it may not be the best choice for students or apartment dwellers. That said, it comes at a very reasonable price and has no plastic parts that will make contact with your coffee. 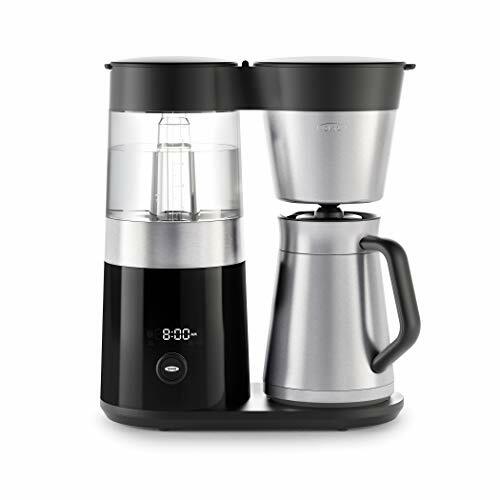 We included this coffee maker on our list for two reasons. Number one, it looks absolutely gorgeous, like an hourglass made from glass and wood, with a steel nozzle at the center. Number two, it makes a delicious cup of cold brew. This machine is a bit more expensive than the other options on our list. A lot more expensive. But good lord, it’s beautiful, and cold brew machines are expensive as a rule. This machine works by severely restricting the flow of water from the upper tank through the filter. It’s designed to keep your water and coffee cold through the whole process, so you’ll want to fill the upper tank with ice before you top it up with water. After that, you’ll be playing the waiting game, watching as tiny, tantalizing brown drops seep through the ultra-fine silicon filter. This isn’t the best coffee machine for everybody. For a commuter, it may be a downright pain to wait for the coffee to slowly drip out. That said, it’s a fantastic option for anyone who enjoys a great cup of cold brew. You won’t find a better cold brew than this outside of a coffee shop. This machine has a minimalist design for the minimalist coffee consumer. In fact, it’s probably an exaggeration to call the Apace Living Pour Over Coffe Maker set a machine at all. 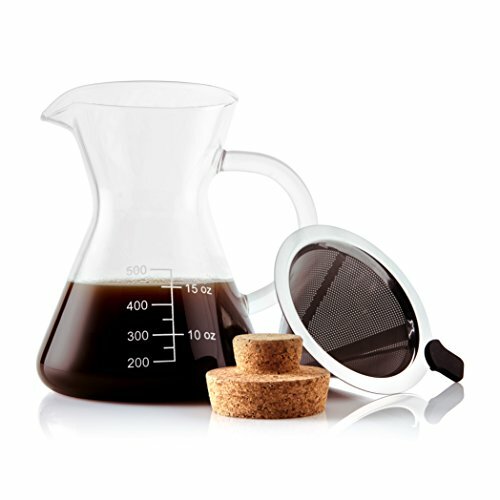 It’s a simple metal strainer, which fits over the top of a single-cup carafe that has a fun, laboratory-themed design. This is a great option for students or anyone who wants to make a portable cup of coffee in their microwave. Just fill the beaker with water, pour it into your favorite microwaveable container, and throw it in the microwave. Wait a few minutes for it to boil, then pour it through the filter and back into the beaker. It’s fast, easy, and the only thing you need to clean is the metal filter, which does require coarse coffee grounds. The price is reasonable, and cleanup is easy. Best of all, you can use the cork stopper to plug up your magic potion beaker and take it on the road with you. The Apace Living Pour Over Coffee Maker set is a great choice for students, or for anyone who wants a fun, convenient, no-frills coffee maker. If you’re the kind of coffee drinker who likes to make every cup an experience, the WeHome Stainless Steel Vietnamese Single Cup Coffee Drip Brewer is definitely the coffee maker for you. This coffee brewer is 100% stainless steel, so there’s zero plastic to worry about getting into your coffee. The basket doesn’t require a filter, but you may want to consider a small paper filter if you’re using pre-ground coffee. Because of the large holes in the metal basket, anything but a course, home ground coffee will tend to slip through. This coffee maker is extremely convenient to use if you’re limited to a microwave or electric kettle for heating your water. Just fill the basket with grounds, and set the coffee maker so the steel flange rests on the lip of your coffee cup. Next, fill the basket with hot water, and you’ll have a cup of delicious brew in just a couple of minutes. Because of its simple design, this coffee maker is a great option for students and apartment dwellers. It can be cleaned in a sink with warm water, and stores easily even in a small cabinet. Here are the top questions and answers about the stainless steel/BPA free coffee makers. If you’ve been following health news in recent years, you’re probably aware of the health risks of Bisphenol A (BPA). BPA is an endocrine disruptor that can lead to a variety of health issues, including infertility and even cancer. For many years, BPA has been used to make plastics, including the plastics used in coffee makers. In most European countries, it’s easy to tell whether or not your coffee maker’s plastic contains BPA. That’s because European regulations require manufacturers to display a warning label when their product has BPA in it. In the US, there are no such regulations. The only way to tell if your coffee maker is BPA free is if there’s a BPA free label on the package. If there’s not, your best bet is to assume that your coffee maker’s plastic contains BPA. Even if your coffee maker is made with 100% BPA free plastic, it may not be very healthy. Two of the most common replacements for BPA are Bisphenol S (BPS) and Bisphenol F (BPF). These chemicals have recently been shown to be as bad for your health, if not worse than BPA. Although more studies still need to be done on these replacements, the best evidence shows that the safest plastic for your food is no plastic at all. This is especially true for hot foods. Hot water absorbs toxins much faster than cold water, which is why plastic coffee makers are a major source of toxins. Do Coffee Makers Grow Mold? Of course, it does! Mold will grow in any warm, moist environment, and your coffee maker is no exception. An NSF study recently found mold, yeast and coliform bacteria in the majority of coffee maker reservoirs. Not to be gross, but we looked it up, and that’s poop bacteria. We’re guessing you don’t want that in your coffee. Fortunately, there’s some good news. You can clean your reservoir and water lines easily with a vinegar solution. If you do this at least once a month, you’ll keep harmful levels of mold and bacteria from growing. The filter and filter basket are also good places for microbes, particularly mold. The best way to avoid this is to empty your filter right away after making coffee and clean it with warm water. It’s a good idea to leave the machine’s filter basket open as well, to let it air out. Of course, another way to minimize mold and bacteria growth is to use a coffee maker without a reservoir. A French press or a single cup drip coffee maker is a fantastic choice for this reason; you wash the whole thing after every use, which is pretty painless. Glass coffee makers and stainless steel percolators take a little longer to clean than a French press, but these machines will make several cups of coffee at a time. They also don’t have traditional reservoirs, so there’s no warm, wet tank sitting around and turning into a biology experiment. There’s no automatic, drip coffee maker that’s totally plastic free. At the very least, these machines will have some plastic water tubes, and most have plastic filter baskets and plastic carafe lids. That said, there are several automatic, drip coffee makers that use only BPA free plastic, and make as many parts as possible out of glass or stainless steel. We’ve included reviews of a few of these machines. They’re not 100% plastic free, but they’re as close as possible while still being automatic. If you need to set a timer in the morning, the best idea is to get one of these machines and use an aftermarket filter. There are lots of metal filters out there. While cheaper ones can sometimes leave an off taste, a high-quality gold filter delivers the best flavor of any filter on the market. If you enjoy the experience of making coffee and don’t need to worry about a timer, there are a few types of plastic-free coffee machines available. We’ve tried to review the best of each type, to give you a good idea of what’s out there. 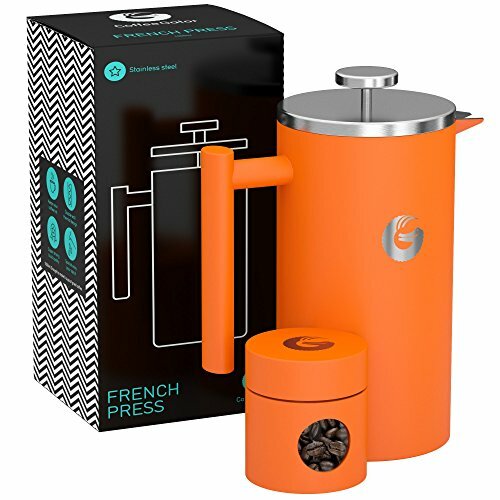 Whether you’re looking for a French press, a percolator, a small drip coffee maker or a cold brew machine, we’ve got you covered. 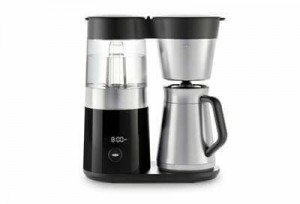 What is a BPA Free Coffee Maker? There are several types of BPA free coffee makers. 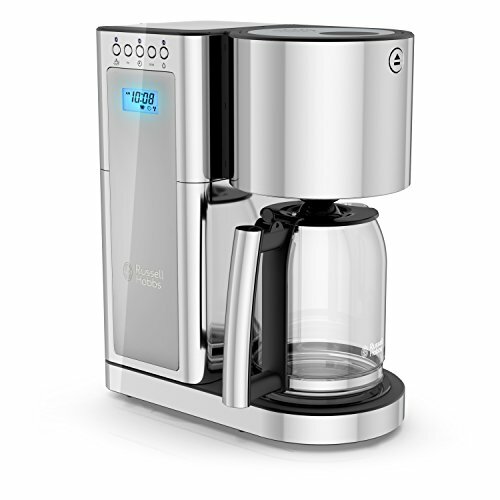 The first is a standard, automatic drip coffee maker made with BPA free plastic. Depending on the exact machine, these may use a lot of plastic that happens to be BPA free, or they may use as little plastic as possible. The second is a stainless steel percolator. These are generally 100% plastic-free, although some of the ones we’ve reviewed have plastic handles that don’t come in contact with your coffee. 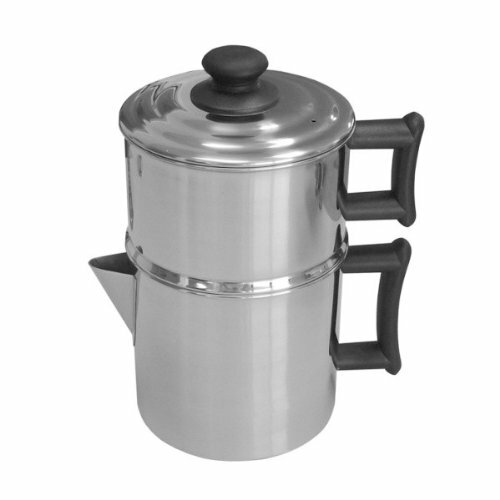 These traditional percolators will be familiar to some older readers. The carafe doubles as a reservoir. You fill it with water, and set the filter basket in the top of the machine. When you bring it to a boil, the water bubbles, or percolates, up into the filter and into the grounds. Because this method is less efficient than a drip style coffee maker, percolators can take longer to make coffee, but most models make several cups. Some models are electric, while others need to be heated on the stove. The next type of coffee maker we look at is a French press. These work faster than a percolator, but generally, only make one or two cups. In these models, the reservoir also doubles as the carafe. You first put the coffee grounds into the reservoir, then top it off with hot water. There’s a plunger on the lid that has a metal screen on the end. After the coffee has steeped for 7 to 10 minutes, you press the plunger down, and the screen filters the coffee grounds out. While French presses are generally made of glass and have metal screens, many of them have plastic lids. The one we reviewed is plastic free, but keep this in mind if you’re shopping for a different French press. Single cup drip-style coffee makers are a nice choice if you like your cup of coffee to be an experience. The machine itself is a small metal filter basket with a flange around the base that lets you set it on top of your coffee cup. You fill the basket with coffee and hot water, and wait for it to drip out into your cup. We also reviewed a glass cold brew coffee maker which is a pretty common design. It has a gravity feed with no heater or pump, so there’s no need for plastic. The glass tank on top feeds water through the filter into the bottom tank, with the flow severely restricted so the cold water has time to absorb plenty of flavor and color. Finally, we reviewed a single cup pour-over coffee maker that has a very simple design. It’s a tempered glass beaker with a big handle, and a metal basket you set inside. Put your coffee grounds in the basket, pour hot water over them into the roaster, and you’ve got yourself a cup of coffee. Is it BPA free or plastic free? The automatic drip-style coffee makers we reviewed are BPA free, but all coffee makers of this style are made with at least some plastic. If you’re looking for a machine with no plastic whatsoever, you’ll need to choose a different design. How many cups does it make? A single cup drip-style coffee maker is fun to use and a conversation piece. But if you’re making coffee for four people, or you’re in a hurry in the morning, it’s probably not the best choice. How hard is it to clean? The fewer parts there are, the more there is to clean. A cold drip coffee maker can make some delicious beverages for a hot summer day, but it takes more time to clean than a French press or a percolator. Is it electric? Will it work with a microwave? Everyone loves the classic look of a stainless steel stovetop percolator. It makes delicious coffee, too. But it’s not convenient if you’re in a hurry, or if your stove is already occupied. Of course, there are other factors to consider, too. Among them are the price, how much counter space the coffee maker takes up, what accessories come with the machine and, of course, how good the coffee tastes. No one coffee maker is the best for everyone, so take all of these things into account when you’re making your decision. Whether you decide to go with one of our recommendations, or whether you decided to go another direction, we hope our review was helpful. Now get out there and brew some coffee! 1.11.1 Is the Plastic in Coffee Makers Safe? 1.11.2 Do Coffee Makers Grow Mold? 1.11.3 Is There a Stainless Steel Coffee Maker With No Plastic Parts? 1.11.4 What is a BPA Free Coffee Maker?